By Mike Ellis. The Disney Dining Plan is often a subject of great debate between Disney fans. Some people swear by the Disney Dining Plan, insisting that they do not experience their vacation fully without adding the Disney Dining Plan — or getting it for free through a Disney promotion. Others insist that the Disney Dining Plan isn’t worth the money you spend, that you end up overeating, not enjoying yourselves as much, and that the resort drink mug you get with your plan just isn’t worth it. In this post, I’m going to take an in-depth look at the Disney Dining Plan and help you discover if it is worth it for your family, and if it isn’t, I’m going to also explore some options that may be a better fit for you. As always, I invite you to comment and let me know your thoughts, and tell me — do my points make good sense or do you think I’m full of it? Quick Service Dining — The Quick Service Dining plan will give each person in the travel party aged three and up two counter service meals per night of stay, plus one snack, along with a refillable resort drink mug. The Quick Service Dining plan is the least expensive option. Plus Dining — The “Plus” Dining plan option is the one most people go for — it includes one table service meal, one counter service meal, and one snack per person, per night of stay, for everyone aged three and up. It also includes the refillable resort drink mug. Deluxe Dining — The Deluxe Dining plan option gives each person in the travel party aged three and up three meals per night and two snacks per night of travel, along with the refillable resort drink mug. The three meals can be any combination of table service and counter service meals. I like the idea of having my vacation expenses already taken care of as much as possible before my vacation. By ordering the Disney Dining Plan, I already know that I have my dining taken care of except for any alcoholic beverages (which are really few and far between) and gratuities to our wait staff. I am a person that likes to eat. As a result, I like being able to try out restaurants that offer food that I won’t normally experience when I’m back home. It is for this reason that I really enjoy Akershus Royal Banquet Hall in Norway. The food is authentic, and is something I just won’t experience back in North Carolina! 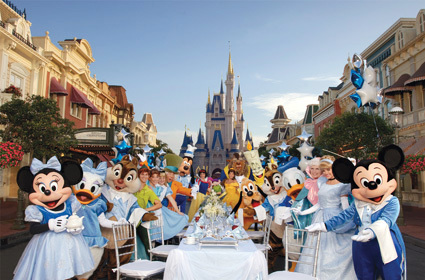 One thing we like to reserve is character dining restaurants. By doing so, we are filling our bodies with energy during our meal, and we’re also taking care of a large number of our character pictures and autographs that we want to get as well! As you all probably know, one of the biggest things that I love about our Disney vacations is the Disney Magic and special Memories that we have experienced. Many of them have happened during our table service meals, and I don’t want to miss those opportunities! Lastly, while there are a great number of incredible counter service restaurants — for my top ten, just click here — eating the Disney equivalent of fast food does get old after a while, and I don’t think that it is nearly as healthy as a good, relaxing, sit down meal at a table service restaurant. For these reasons, I really enjoy the Disney Dining Plan. Now, in comparison, let’s take a look at five reasons why the Disney Dining Plan may not be the best option for you. Expense. The Disney Dining Plan is not cheap — in fact, for a family of four (two adults and two children aged eight and five) that is going to Walt Disney World in late June for six nights and seven days, the cost of their dining plan comes out to $930.48! That is a huge expense. For a family on a budget, that is potentially a big savings, depending on how they plan to take care of their meals while they are there. Picky/small eaters. In many cases, guests that travel to Walt Disney World are either very picky when it comes to the food they like, or don’t eat a whole lot. In either case, if you are making one table service reservation after another for your stay, you may find yourself or your kids not eating very much, and definitely not getting your money’s worth with regards to what you are paying for the plan. Your family is always on the go. If your family is the type of family that is always on the go, wanting to get to the next attraction and the next show and on and on and on, the Disney Dining Plan may not be for you because you might not want to take time away from your time enjoying the great attractions and shows. In a case like this, the Quick-Service Dining Plan might be a good alternative for you. “Scheduling your vacation.” In many cases, people don’t like to go for the Disney Dining Plan because they don’t like having to make reservations for restaurants — they feel like they are planning every minute of their vacation because of the reservation times for their table service restaurants. In cases like this, the Disney Dining Plan is probably not for you. Lastly, if you are not staying on Disney property for your resort stay, you can not participate in the Disney Dining Plan. So, if you are leaning in the “against” group when it comes to the Disney Dining Plan, it’s okay — you can still take advantage of the great Disney table-service restaurants to enjoy. If you have a big enough party size, one option that may be of interest to you is the Tables in Wonderland card. This special dining card — which, by the way, is only available to Florida Residents, member of the Disney Vacation Club, or Annual Passholders — offers 20% off dining costs at over 100 Walt Disney World restaurants, and is good for the cardholder and up to 10 additional guests. The cost of the card is $100, and the card is good for one year from time of purchase. However, if you use the Tables in Wonderland card, you will automatically be charged an 18% gratuity, so keep that in mind when using it. There are cases where I don’t think the Tables in Wonderland card is going to result in savings. I hope that this article has helped you in your understanding of the Disney Dining Plan, and whether or not it is right for you and your family. If you are interested in a quote for travel of your own, click on the image at the bottom of this post or on my sidebar on the right. Each will take you to my quote page where you can fill in your information and generate an email to me for requesting a quote. Also, if you have any other questions, please feel free to leave them in the comments, or email me at Mike@PixieVacations.com. Lastly, let me know — do you like the Disney Dining Plan, or do you do without it? Let me know in the comments as well, and thanks for stopping by! Previous Post: The Lands of Disneyland: New Orleans Square!